Eye catching bridal shower tableware patterns will impress your guests with along with other table setting decorations. Try our Party Pack kits each include different options of tableware, balloons and banners, kits are our basic kit, deluxe kit or ultimate kits. Our Pretty Present Personalized Ultimate Party Pack features a sophisticated design of ribbon and trellis. You will select the background color and add your wording and/or photo to the plates and cups. The party pack will come with eight place settings, coordinating decorations and even a personalized vinyl banner. Create a lasting impression when you give this unique wedding bouquet as a gift for the new couple, or as favors or desserts for the guests. 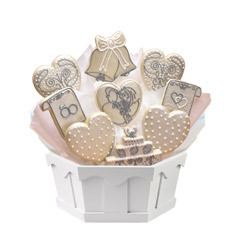 This romantic cookie bouquet is also ideal as a table centerpiece. It will be remembered for years to come. This item is priced as a 9 cookie.